Casio F-91W – sign of al-Qaida! 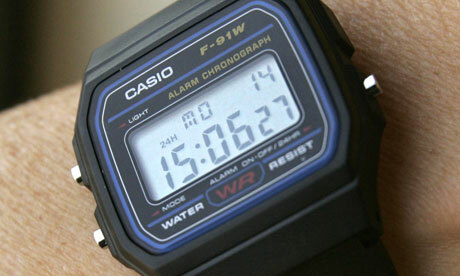 The Casio F-91W wristwatch, regarded by Guantánamo Bay interrogators as a sign of al-Qaida involvement. It is cheap, basic and widely available around the world. Yet the Casio F-91W digital watch was declared to be “the sign of al-Qaida” and a contributing factor to continued detention of prisoners by the analysts stationed at Guantánamo Bay. Briefing documents used to train staff in assessing the threat level of new detainees advise that possession of the F-91W – available online for as little as £4 – suggests the wearer has been trained in bomb making by al-Qaida in Afghanistan. The report states: “The Casio was known to be given to the students at al-Qaida bomb-making training courses in Afghanistan at which the students received instruction in the preparation of timing devices using the watch. More than 50 detainee reports refer to the Casio timepieces. The records of 32 detainees refer to the black Casio F-91W, while a further 20 make reference to the silver version, the A-159W.